Hard dough bread is a product you used to only be able to buy at decent bakeries in ethnic areas. You can now pick it up an mainstream supermarkets. 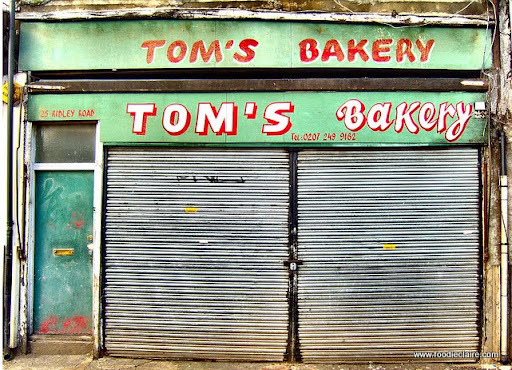 I regularly buy mine from a bakery that has been around since I was a little girl, Toms Bakery in Ridley Road market, Dalston. I’m fortunate enough to be able to go there on my lunch break at work. Failing that, the Rainbow Bakery on Kingsland Road is another favourite. Bacon: I used streaky bacon rashers as the flavour and texture is better than normal, but it must be smoked! Slice the plantain any way you want – long ways or into coins and deep fry in a wok (make sure the oil is hot enough – you can do this by frying a breadcrumb and checking how long it takes to brown). Once the plaintain has been fried, drain off oil by resting on a sheet or two of kitchen paper. Roughly stir mixture – no need to scramble as it spoils texture. Ensure however, that the egg, creme fraiche and butter is mixed through. Get the frying pan hot with a tablespoon of vegetable oil. Pour the mixture into the pan and use a silicon (preferably – if not then wooden is fine) spatula to keep lifting from the pan and making sure the rapidly cooking egg is moving around the pan. Don’t allow it to stick. It shouldn’t – this is why a mixture of oil and butter has been used – they both stop the egg from sticking and the butter adds to the taste. That looks pretty good, I’m hungry now.